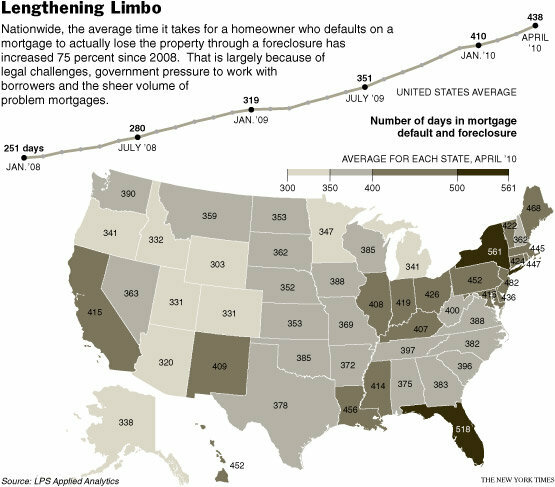 A pretty amazing graphic from the US on the number of days between the homeowner stopping payments and the bank actually taking the property. For Florida, for example, the average amount of time is 518 days. If you calculate 518 days back from April 10, 2010, you get October 2008, near the beginning of the financial crisis. Spain still has a very brutal foreclosure process, where the bank can theoretically come after you even if you make all your payments, but your house drops in value. If you are foreclosed, the bank can still come after you for making up the difference between the mortgage and the sale price. This can be EU-wide, as many British ex-property owners are realizing.